As of April 22, 2019 10:08 AM ET Minimum 20 minute delay. 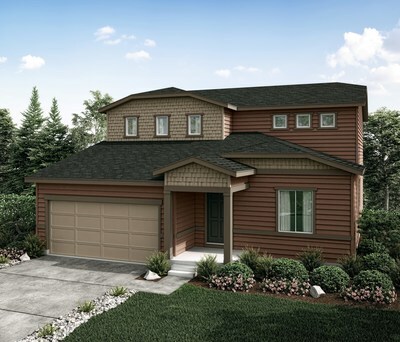 DENVER, Feb. 7, 2019 /PRNewswire/ -- Century Communities, a leading national home builder, announced today that its new Fort Lupton community, Coyote Creek, is hosting a model grand opening of its Century Complete collection. The public is invited to view and tour Coyote Creek's new affordable single-family homes starting in the low $300s. The celebration and model grand opening tour runs from 10 a.m. to 2 p.m., Saturday, Feb. 9 at 2320 Coyote Creek Drive and includes complimentary lattes and desserts provided by a waffle food truck. Coyote Creek is a new neighborhood developed by Century Communities featuring two-story or ranch homes which back up to the Coyote Creek Golf Course. The community offers 11 innovative and open floorplans ranging in size from 1,605 to 2,834 square feet. Homebuyers can choose from 3-5 bedrooms, 2-3 baths, and from 2-3 car garages. Built with lifestyle and budget in mind, these light-filled plans include spacious owner's suites and ample storage. Plus, when new homebuyers purchase by March 9, a new refrigerator is included. Dave Bulloch, Division President, said, "Coyote Creek is a great new community in the rapidly growing and tight-knit city of Fort Lupton. Homeowners will enjoy a historical hometown feel and broad vistas while living next to the natural undulating terrain of Coyote Creek Golf Course. We're excited to offer this product with such easy access to Denver, Denver International Airport, Rocky Mountain National Park, Boulder, Longmont, Fort Collins and Greeley." Coyote Creek is a golf course community close to downtown Fort Lupton and Aims Community College. The Historic Fort Lupton is an adobe trading post established in 1836. Most of the original structure was destroyed but has been recently replicated adjacent to the original site. The city of Fort Lupton sits next to the South Platte River and due to its topographical setting, homeowners here enjoy stunning panoramic views of the Rocky Mountains. The city also features dining and shopping, multiple parks and modern recreational opportunities. The Weld Re-8 School District serves Fort Lupton with pre-school, elementary, middle school and high school. Century Communities, Inc. (NYSE: CCS) is a leading national home builder. Century Communities is engaged in all aspects of homebuilding, including the acquisition, entitlement and development of land, along with the construction, innovative marketing and sale of quality homes designed to appeal to a wide range of homebuyers. The Colorado-based Company sells its Century Communities and Wade Jurney Homes in 15 states across the West, Mountain, Texas and Southeast U.S. regions and offers title, insurance, and lending services in select markets through its Parkway Title, IHL Insurance Agency, and Inspire Home Loan subsidiaries. To learn more about Century Communities please visit www.centurycommunities.com.